EverQuest II - News - Are You Returning to EverQuest II? If you've been away from Norrath for a while, here's a guide to some of the changes that have been made to help you get back into the swing of things! 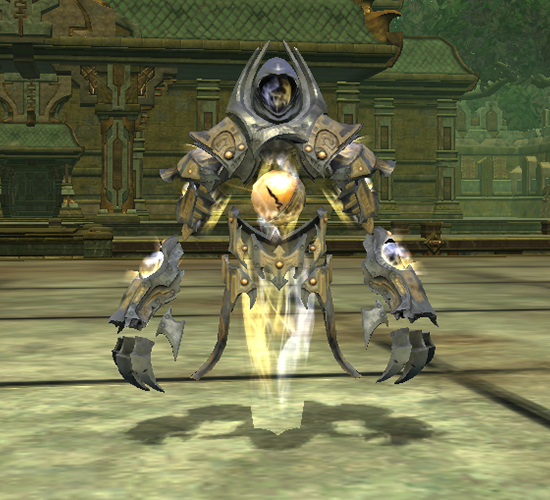 The apotheosis of a specific facet of energy, Ascension classes are the gateway to ascended power for characters above level 100 who possess the Kunark Ascending or Planes of Prophecy expansion packs. Within Kunark Ascending you may speak with one of the four masters in the Obulus Frontier to begin down the path to Ascension. In the Planes of Prophecy you can find an Ascension Trainer in the Coliseum of Valor. Each Ascension class grants an adventurer the ability to shift into an avatar of that Ascension, converting all damage done from any ability that does not deal damage based on your weapon's damage type. This will also convert most pet and swarm pet damage. Elementalist: Wielders of the opposing forces of fire and ice, Elementalists have the power to rain down destruction or degrade the defenses of an opponent. Initiates of this class convert ability damage to cold. Etherealist: Master of arcane and planar energies, Etherealists have abilities that deal with the manipulation of ambient or latent magical power. Etherealists convert ability damage to magic. Geomancer: Sometimes the most effective form of persuasion is the application of brute power. Geomancers are able to bring staggering force down on an opponent, converting ability damage into crushing. Thaumaturgist: Most things have some form of life energy, and Thamaturgists are able to manipulate and control it, twisting and bolstering that energy to meet their needs. Blood Mages convert ability damage to disease. Once an Ascension class has been initiated you will start receiving Celestial Ascension potions from mission crates. These can be used to level your Ascension class. Changing Ascension classes is as simple as going to the appropriate Ascension master and picking up the class. All of the progress made on your current Ascension class is saved, and you will pick up right where you left off when you return to that class. Any Ascension abilities you have earned will remain in the Ascension tab in your spellbook, though you will not be able to access them until you return to the matching Ascension class. Note that many of the abilities in the above spellbook are greyed out because they are from an ascension class that is not currently active. Ascension abilities can combo with other abilities to add an extra effect. 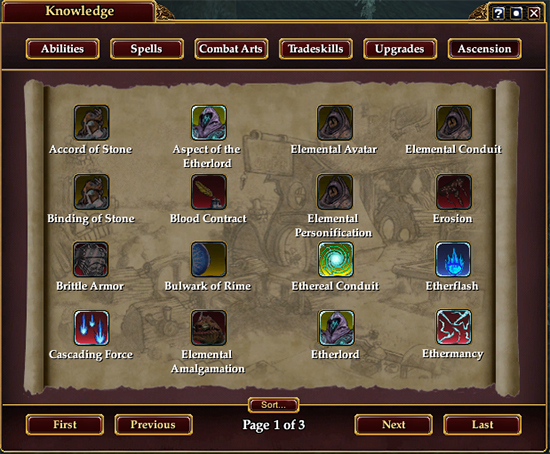 In addition, Ascension abilities have the full range of spell tiers from apprentice to ancient. The strange planar energies released by the opening of the Subtunaria in Terrors of Thalumbra have invested the items found therein with latent energies, granting them bonuses to its granted stats when looted or by tithing coin or equipment infusers found throughout the realms to further enhance the effectiveness of the item. In this example we have Cinder, newly infused so that we can see the stat bonuses that have been modified with the default infusion. Note the "Base" checkbox under the icon on the top right. When unchecked (left) the window will show the items current infused stats. When the box is checked (right), the four grey numbers will indicate the item’s base stat. The Base checkbox will not appear unless an item has been modified in some way. Infusion may be accessed by right clicking on an item in your inventory or with /toggleinfusion. Within the infusion window you have two options on how to infuse the item. The default option is to directly tithe platinum to the gods, enticing them to grant you their favor which can unlock these bonuses. Each subsequent infusion attempt will increase the platinum cost. The second method is to apply infusers, which can be crafted or looted throughout Thalumbra. Purchased infusions work toward one cap on infused bonuses, while crafted and dropped infusers work on an entirely separate cap. This allows you to maximize the enhancements you receive by pursuing both methods of increasing your item's power. The picture below shows the use of the default platinum tithe to further infuse Cinder. In this case it costs 5 platinum to attempt infusion, and it has a 25% chance of successfully infusing a stat bonus. Here, we are using one of the premium infusers, which is represented by the white crystal icon. There is no longer a platinum cost and that the chance of success is 100%. If an item is no longer able to be upgraded by a method, the chance to succeed will indicate 0%. While mercenaries are quite adept at walloping the occasional moss snake, even the most adroit sellsword can be taught a thing or two by an experienced adventurer. With each level gained, your mercenary earns access to one or more equipment slots for armor or mercenary-only Accolades. To start training your mercenary, simply open up the mercenary window and press the "Start Training" button located near the bottom. The training time required to obtain the next level on your mercenary begins at three days, which progresses whether or not you are currently playing, and increases as you obtain higher levels. You may accelerate your mercenary's training by completing each level immediately for Daybreak Cash. Training your mercenary allows you to equip them with any armor that you come across and do not want to personally use yourself. While you must meet the minimum level to equip the armor yourself, mercenaries do not have restrictions on what they can wear. Mercenaries do not change their appearance based on the armor that they equip in these slots. While a mercenary cannot wear the same jewelry as your characters, they instead make use of special accolades which can be obtained through adventuring or crafting. Mercenaries do not gain the benefits of Adornments, Item Sets, or Effects on their worn items. Familiars are magical critters found throughout Norrath that that can be used to enhance the power of their master, and granting them triggered or passive effects. Familiars come in four tiers: Treasured, Legendary, Fabled, and Ethereal. You can start filling your familiar menagerie by visiting Steward Kres in Freeport, or Steward Aelin in Qeynos who will grant you a daily mission to collect specimens for a reward of a random familiar. Familiars can also be found as rewards from many adventuring or public quest missions. When first obtained, your familiar will be a level one familiar, granting its base bonuses. Each familiar can be leveled up to level 10, and each level increases the statistic buff values by twenty percent. Triggered and passive effects are not modified by familiar levels. Familiar Tonics and Training Potions are available through various promotions and events, such as Yun Zi the Days of Summer merchant. When consumed, these potions immediately increase your currently summoned familiar's level by 1. Different tonics have different restrictions on what level they can raise your familiar to, so apply them with care. In addition to familiar training potions and tonics, you will also be able to use new familiars to level your favorite familiar. The amount of experience that the familiar is worth is based on its tier. Common treasured familiars are worth 100 experience, while uncommon legendary familiars are worth 1,000. Fabled and ethereal familiars are worth even more! Familiars cannot be consumed out of your familiar collection, only from your inventory bags. Familiars earned through /claim, quests, and any other specialized way will not be able to be consumed for experience. Is your bank a giant shoe closet? Do your bags double as a coat rack for your favorite threads? Well fear not, the Wardrobe feature is here! With the Wardrobe, players can store the appearances of their items on their character to be worn as appearance gear without cluttering up precious inventory space. To add equipment, click on the Wardrobe tab in your character window and drag the item from your inventory onto the "Add to Wardrobe" section at the top of the page. You may also drag the item onto any of the icon rows. You will receive a prompt explaining the item will be destroyed and stating the category the item will be added to. For One-Handed or Dual Wield weapons, you will be asked to choose either the Primary or Secondary category, which can be changed at any time (see Switching Weapon Categories below). There are NO class restrictions that prevent you from adding equipment to your Wardrobe - equipment added to your Wardrobe will be destroyed! 1. Click the "Appearance" tab on the character window, and then click on an appearance slot. If you have Wardrobe items associated with that appearance slot, you will see a pop-out menu showing those items. Clicking on any item in the pop-out menu will equip its appearance. 2. Simply right-click the item in your Wardrobe and choose "Equip Wardrobe Item." To remove equipment from your Wardrobe, right-click on it and choose the "Remove from Wardrobe" option. You will then be asked to confirm the removal. Note: Equipment removed from the Wardrobe will not be returned to your character! One-Handed or Dual Wield weapons may be placed in either the Primary or Secondary categories. If you wish to move one of these weapons to the other category, simply right-click on the weapon and choose "Switch Wardrobe Category". This requires you have an open slot in the destination category. Note: This option will only appear once the icon's examine information is done loading (when you can see the item's tool-tip). Wardrobe equipment is fully functional with your Appearance Item Sets. Once you have your Wardrobe appearances equipped, simply click on the Sets tab (in the Appearance section) and click either the "Create New Set" button or save over an existing set. When dressing a Mannequin, you can access appearances from your Wardrobe by left-clicking on the associated equipment icon slot on the Mannequin's UI. A lot of changes have come to EverQuest II, but they should help make your adventures a little bit easier. Return back to this guide whenever you need a quick refresher - we can't wait to see you back in Norrath!